This tender, vigorous, evergreen climber belongs to the Acanthus family; Acanthaceae. 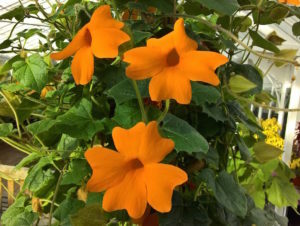 It is closely related to ‘black eyed susan’ or Thunbergia elata. The common name of clock vine relates to the vine spiralling upwards in a clockwise direction. It grows to 2.4 to 3.5m tall, or if left without support can become an extensive ground cover. Its bright orange flowers, 4.5cm across are attractive to bees. Hardy to -1 C, Thunbergia gregorii flowers more profusely and even year-round in warmer climates, while restricted to summer and autumn in cooler climates. It prefers a sunny spot with plenty of air movement. Propagation is by cuttings taken in the summer or by seeds sown in the spring.